BIRMINGHAM, AL (October 12, 2015) Arlington Cottages and Townhomes developed and constructed by Capstone Collegiate Communities is located on a 20 acre site just a short distance from Louisiana State University on the corner of Burbank Drive and Ben Hur Road and consist of 179 units and 732 beds. The property has varying sized cottages, duplexes, and three-story townhouse units creating a diverse unit mix. The master plan of the neighborhood features a tree-lined entry boulevard with an inviting view of the clubhouse. The clubhouse design is inspired by traditional French architecture. It combines traditional details with modern conveniences that produces an end result that is both true to the surrounding context while maintaining a fresh feel that will appeal to the residents. The architecture and unique design of the amenity spaces gives Arlington Townhomes a sophisticated feel, something truly unique in the market. The clubhouse and surrounding amenity space will be the heart of the community, allowing everyone to live, play, study and relax together. 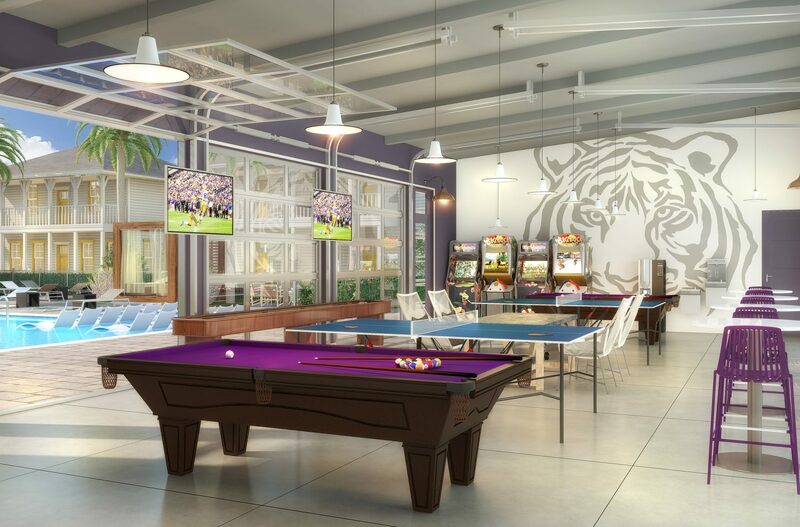 The clubhouse has a number of luxury amenities including free tanning, a sauna and steam room, an entertainment area with big screen TVs, plus private and group study areas. The residents will also be able to enjoy a zero entry resort style pool that is surrounded by trellis covered cabanas and a pool house that opens both to the pool and the sand volleyball court. The pool house will house gaming tables and it will have 6 large garage-style doors that can open to make it truly an indoor-outdoor space. Arlington Cottages and Townhomes also has carefully designed civic spaces that form sub-districts within the overall neighborhood allow residents to gatherer together. The porches of the cottages will front streets lined with sidewalks to encourage social interaction. The street and building lighting and regionally-appropriate landscaping will further add to the sophistication of the traditional neighborhood.